Multiculturalism is usually associated with coexistence or even simultaneous harmonious living between different people of different cultures which includes ethnic groups, religions, races that are manifested in different everyday behaviours, habits and rituals. As today's economy continues to grow, many countries in today's world are filled with populations of different cultures and customs. With variation brings about conflict and tension that hence results in an unhealthy community. Our aim in this aspect of a growing city is to minimize segregation within different categories of populations and to promote a healthy harmonious home to many. Throughout our discussions during the conference we've discussed a few different core values we would want to treasure in our city; a few of them being physical health of our citizens, education, preserving and regulating price ranges of different housings and creating an inclusive community with great neighbourhoods and public spaces. The GAT group discussion stimulated our visualisations on how we pictured our perfect city which we further brought into a mission statement. "People of different cultures living in the healthy, integrated community will have a sense of belonging and unity, at the same time preserving their own cultures, exhibiting individualistic creativity and innovation. During our first try on creating our own utopia, we were inspired with the way successful cities such as Dubai and London had managed to organise their cities into different rings of categories of infrastructure and so we came up with our own way of categorising our city. 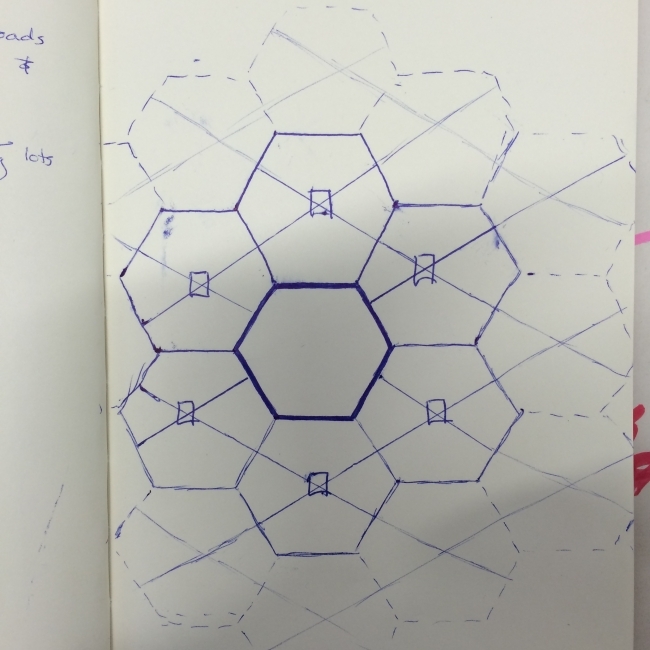 The above image shows a hexagonal shape themed city which was initially aimed to have a balance of interaction between a community and another. The hexagon in the centre represented the central area of the city which would consist of official buildings and forms of entertainment while the neighbouring hexagons would host different purposes and focuses. After a session of debates and constructive opinions, we later realised that this might initiated spatial segregation and hence we modified around it and created the latter. The section below will further explain our venture into creating a city of our own, Metanoia. The diagram shows a long-term plan for Metanoia as a settled city. Our aim is for people of different cultures to live in a healthy, integrated community with a sense of belonging and unity and at the same time preserving their own cultures, exhibiting individualistic creativity and innovation. If at all segregation arises as an issue, we plan to strategically place basic necessities and community infrastructures to improve the integration. Metanoia is distributed into smaller communities that includes residential areas, educational breadths, health institutes and a central district. This initiation is to acknowledge Metanoia to be an organized and all-rounded city. Each community will be distributed around the central district so that citizens will have easy access. The central district will be organized into different rings that is specified into different focuses such as a Kid’s areas, shopping areas and a central park. The economic sector is placed on one of the outermost rings of the central district to create easy access for commuting citizens. Our city of the future aims to provide an eco-friendly and healthy environment that brings in the idea of the central park. The central park acts as a point of interaction between citizens from different communities and cultures, this minimizes the chances of segregation. 1. The residential communities will be strategically placed all around the central district to allow easy access for the citizens. Between 2 communities would usually be common facilities (i.e. services, health institutions) to initiate minimal interaction. 2. Basic health institutions are placed close to the populations. Healthcare centers vary in sizes depending on the size of the population in parallel with it. Centers vary from neighborhood clinics to large specializing hospitals. 3. Basic services such as corner shops or community hairdressers will be provided to the nearby residents for their perusal. This aims to integrate 2 communities and allow them the chance to interact. There will be such shops in the central district but services on the sides of the residential community grants the citizens easy access and less travel time into the central district. 4. Parks act as an awareness of physical health of the citizens; Local activities will be held throughout the year in the Central Park to initiate not only physical health but also interaction within the city. Every residential community will contain a local park to further emphasize on the importance of a eco-friendly green living quarter. 5. Similar to a Hoyt Model, the government sectors branches out into 4 directions aiming to distribute services all around the city. Emphasizing on the convenience of the citizens, this again allows easy access for the citizens when in need of approaching any official matters. 6. Education levels ranging from pre-school all the way to high school for local citizens will be provided in these areas for free. It is placed nearby to residential areas to promote education and provide equal opportunities. This in the long run will improve literacy rate of the city. 7. A market place is found in the core of the city to address multiculturalism, as the market will host venders of different cultures and ethnics. It is conveniently near a lake as an incentive for citizens to enjoy the scenery while having their own family activities on weekends. 8. The city’s very own University is strategically placed on the sub-urban areas to meet comprehensive needs of the students during the practical aspect of their studies. The environment of the suburbs acts as an incentive for the students as well. 9. The train and bus station is placed on the suburbs in coordination with the transport system. One of the reasons of the location is for the convenience of out of town commuters. 10. The airport is placed away from the city centre to allow for a larger freeway and to minimize the potential noise pollutions from the engines of the planes. The large freeway will allow for less air traffic that will allow more airlines to enter our city. 11. Having a common kid’s area will allow children from different communities and cultures to come together to form an integrated community. 12. The economic region is placed in the central district so that people of different communities will be able to come together and promote products of their own cultures, forming an integrated community.